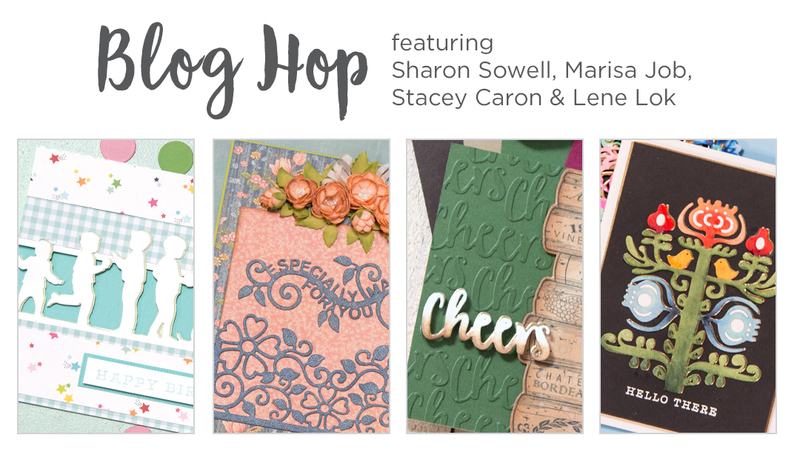 I am delighted to be part of the Spellbinders Blog Hop today! I hope that you get inspired by the participating guests as the shared projects are die-namite! If you arrive from the blog of Susie Lessard, you are in the right place. If not, come and join the fun hop for ideas and inspiration! This die is pretty much one of my favorite silhouette dies...ever. I decided to use alcohol inks to create a colorful image and background. There are two layering parts in this design: vellum paper and Yupo paper. All products used are linked below (affiliate links applied at no cost to you). I also stamped the same colors with Sewn With Love (Altenew). At the end, I decide to add tiny bits of sequins to the bottom as the images appeared to be magical to me! Hope you get fancy and free feeling! There are a few techniques involved in this card, namely, Emboss Resist and Inlaid Die-cutting. 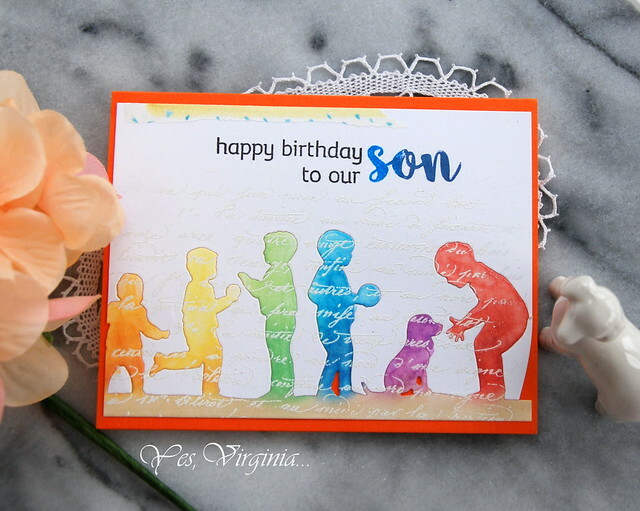 The rainbow colors depict a lively and happy scene: a growing boy and a dog. What could be more perfect!? Noticed the white-embossing with Script (Penny Black)? I encourage you to try out these awesome silhouette images if you have not have any dies like these. Previously, I also shared my take with this die from the same collection. They really are fun and versatile to create with! Giveaways : To celebrate this release, Spellbinders is giving away a $50 gift certificate to a lucky winner. 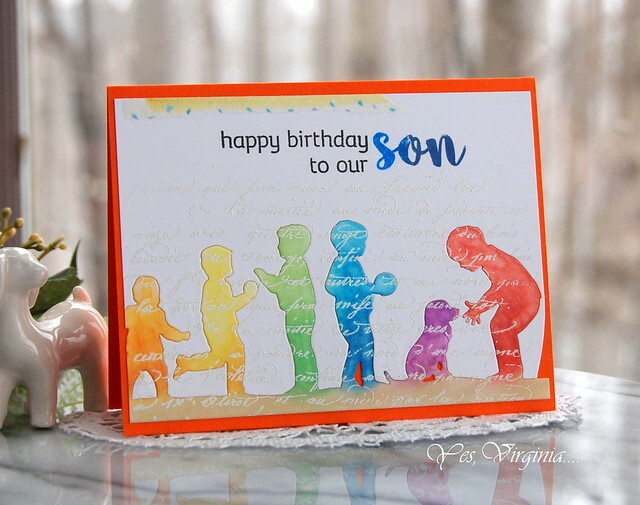 Please leave a comment on Spellbinders blog by Sunday, April 22nd 11:59 pm EDT for a chance to win. The winner will be announced in the blog hop post on Spellbinders blog the following day. Winner is responsible for shipping cost, duties and taxes. MORE Giveaway: I get to give away $25 gift certificate to Spellbinders blog! Please comment in this blog post by April 24th and the winner will be announced on April 25th right here in this blog. Your next hop is the blog of the fabulous Nina-Marie Trapani! Oh, my, these dies are so awesome! We have Danish and Norwegian ancestry so the Nordic set is stunning and familiar designs. The children sets are a must! Thanks for sharing, Virginia! oh my gosh I love what you did here! I love the emboss resist... and the rainbows. So perfect! I love what you did with these dies. Such an amazing set of cards. I really love this particular die set. Awesome cards, love how you showcased the new dies, especially the First Adventure card. The offset arch really highlighted this beautiful cut. Your cards are so imaginative, just absolutely wonderful designs! Simply gorgeous this way of using this beautiful dies! I love how you added sequins at the border on the first card; so cute! All of your cards are so lovely. Great array of dies in this release. Your cards are fabulous, Virginia! I love the silhouette dies! My absolute favorite is your "Happy Birthday to our Son". It came out gorgeous, I just love your shading causing to go into a rainbow effect. Just loving it! Your cards are adorable and I'm sure these Little Loves Die sets are going to be very popular! Great cards and the combination of colors are great too! These are such sweet cards! See the application on scrapbook pages as well. Love the silhouettes. Your fist card wowed me! These children's cards are beautiful. The first one is in my favorite colors and took me back many many and more many years as we played at the foot of the mountains. Thank you for sharing your talents today. Great job with those silhouette dies, Virginia! Especially love the colorful inlaid one with the text over!! I love how you juxtaposed the plain dies against the colorful, natural backgrounds. Just genius! Gorgeous cards - the silhouette dies are awesome. SO lovely! My favorite thing is the text as a shadow layer behind the sillhouette in the last one. It's a subtle little detail with a beautiful impact. Thank you. Love the scene in your card. The new Little Ones dies are just great. Thanks for sharing. I like the emboss/resist rainbow card. Magical, happy, and free spirited are apt descriptions of your wonderful card using the Every Day is a Happy Day-- Little Loves. The combo of the inlaid die and silhouette is stunning! Thanks for sharing such great inspiration. These dies are so adorable and you used them to their best advantage. Love all the cards but I'm swooning over the rainbow with the text. It's amazing. Well done!! Woot! You've made these dies just come alive with possibilities in my mind. I absolutely adore the second card with the boys & the dog. And the background on the first card is fabulous. Thanks so much. This is an awesome variety of cards using some of the new release! I am a big fan of Spellbinders and have bee for years! what a super idea to use the papers you did for Happy birthday to Son! All are cute, but that first one is so adorable. Love the scenic background you created. These cards are adorable. I especially love the card with the inlaid design! These cards are too sweet with those dies. I love the techniques and coloring you used. Thank you for sharing. Your cards are so cute. I am partial to the silhouette dies. I like the alcohol ink background. It’s a great complement to the silhouette! Wow! What a variety of cards! Love how you used the vellum, the yupo paper, inlaid diepcutting, and the script decorating die cuts for one of the cards. Fantastic cards Virginia. Love the yupo paper background on the first one... such a sweet scene. The script print on the second looks so cool! Amazing designs! i LOVE the inlaid die cutting/emboss resist card! perfection! What a cool technique with the layering. I love the colors. These are so fun and colorful. Love the new dies. I am in love with these darling silhouettes and I love what you've done with them - Especially the emboss resist inlaid rainbow!! Thanks for sharing your beautiful creation to introduce Spellbinder's new products and INSPIRE! Spellbinder sure have some very unique and elegant products! Wow! Amazing cards! I love the alcohol inked background and images on your first card. Just gorgeous! The cross stitched hearts are a sweet, unexpected touch in the corner of the card. 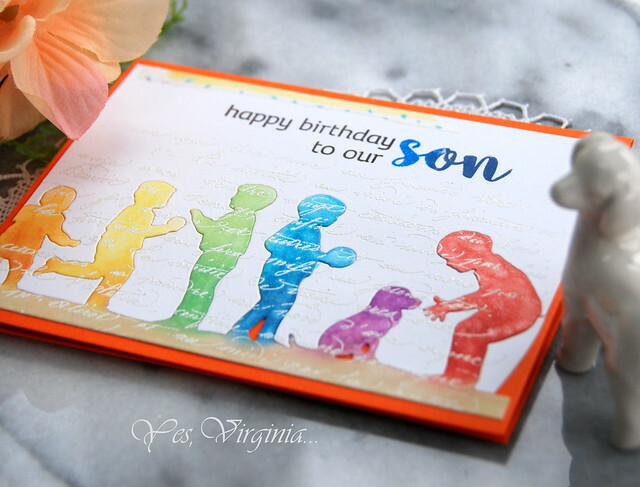 Your second card with the inlaid design is so clever, especially with each image done in a different color of the rainbow. Beautiful! I'm in love with your gorgeous cards! Every one is gorgeous. My favorite is #1 as I love the background colors but they are all amazing! This is a great release from Spellbinders. Their product looks to be of very high quality. I hope to try some out one day. Love the ideas for the cards you've created.. so beautiful! I love them alol, but the second card is especially wonderful. Great technique. 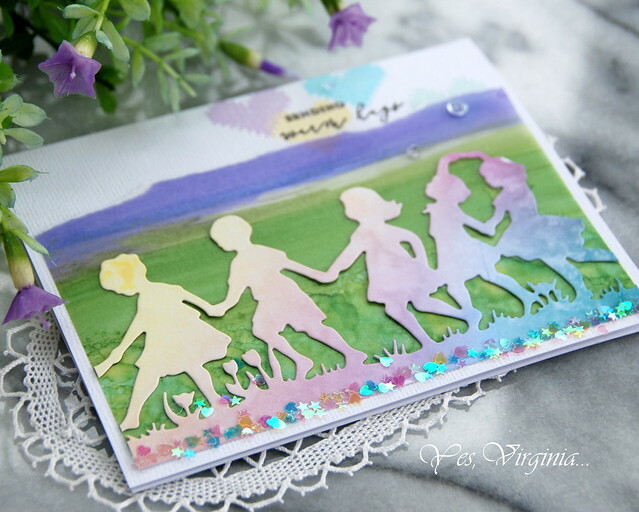 Beautiful cards with these pretty silhouette dies! I really love the coloring on the die cut on your 1st card! Love what you have done with these new release items, I really like emboss/reset. Your cards showcase these new products wonderfully. Thanks for sharing your creativity.